Property 3: Stunning Mountain Views! And So Much To Do! Family & Pet Friendly. Property 7: Amazing Views, Game Room, Hot Tub & More! Bedding for 8! Military Discount! Property 13: View, View, View, Gorgeous Long Range Mountain Views! 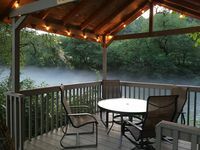 Property 15: Riverfront - Perfect for family or group getaways! Nestled among the trees! Close to town! Property 21: Nestled among the trees! Close to town! A beautiful 4 bedroom Chalet in Historic Coker Creek , Tn. Property 27: A beautiful 4 bedroom Chalet in Historic Coker Creek , Tn. Welcome to Summit at Crisp Mountain - A Stunning NC Mountain Chalet! Property 28: Welcome to Summit at Crisp Mountain - A Stunning NC Mountain Chalet! If you are looking to get away from the city and ready to enjoy nature, this is the perfect spot. Nice weekend getaway, definitely off the beaten path. Had a great time, beautiful place. Unfortunately it rained the whole time, but had plenty to occupy the time in the trout chalet. Sitting on porch listening to rain on metal roof was nice change of pace.